Neville Chamberlain gave Europe a good lesson on the futility of Utilitarianism. But wait a minute… Isn’t Utilitarianism a good thing? The greatest good for the greatest number sure sounds democratic. 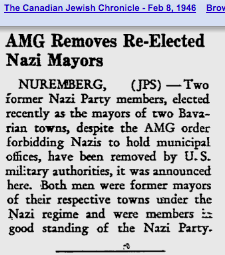 Then again, German Democratic Republic and Democratic People’s Republic of Korea also sound democratic. Enter the Utilitarian Monster. The Utilitarian Monster lives in a Gedankenexperiment in which an evil monster in, say, a Zeppelin, arrives at the city gate and demands the sacrifice of one individual or else the entire town will be bombed. The City Fathers vote to sacrifice you, dear reader–BECAUSE THEY LOVE YOU! Yes, true Christian sacrifice is the surrender of that which you value more in exchange for what you value less. If they valued your egotistical selfishness, they would never have surrendered you. It is precisely because altruistic collectivism says you are innocent and good that your life gets crushed. Cowardice is preserved, and everyone is happy–happy, that is, until the Utilitarian Monster returns the following day with the same ultimatum. Yes, this is headed in the same direction as those chapters on sequences and series in math class… Everyone in a utilitarian village can be wiped out, one at a time, by bluffing. But to Prime Minister Neville Chamberlain, mathematics was just theory. Peace was the important thing and sacrifice by appeasement was what everyone–the teachers, reverend clergy, government school philosophy and ethics teachers, Adolf Hitler–all said was good, right, socially benevolent. The ethics was settled, and it was time to put it into practice. Unfortunately, the Czechoslovakians were the ones being pushed onto the altar of altruism and sacrifice, and the experiment was real, not Gedanken. Conservatives hate Carmen Miranda and Mae West for pretty much the same reason. Conservative ideology hates freedom and worships superstition and coercion. If you want to replace bad ethics and politics with something better, you might want to look into the Libertarian party. As usual, These States got sucked into the vortex of that foreign war after the attack on Hawaii. Newspapers and radio were the internet of the 1930s and 1940s. In their pages young Ayn Rand read about Sweden’s fantastic new Harden metal alloy, shadowy Match Kings and Beer Barons. 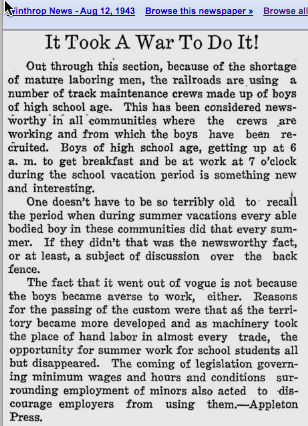 She read about young men whose ambition led them to hire on with railroad maintenance crews in 1943 before maturing into Copper Barons able to rattle stock markets into a panic with a gesture. This latter news item was framed in exhortations to buy war bonds, with air raid signals and instructions on the facing page. She also read of the Allied Military Government putting some Nazis back in power while hanging others for genocide as she was writing Atlas Shrugged. The same thing is happening today. Christian National Socialism, motivated by altruism, now targets a different semitic people and religion–all the while angling to monopolize and control drug markets through the only mechanism it understands… war, coercion, murder. Totalitarian communist territory has dwindled to Cuba, China, North Korea, Venezuela and a tiny scattering of pestilent dictatorships likewise limited to war, coercion, murder as ways of getting things done in the name of altruism. The ku-klux fascists‘ competition? Lay or Gaian socialists claiming to be democrats, likewise motivated by altruism–and guided by pseudoscience to rule by violence. Christians and Gaians alike are terrified of imaginary hobgoblins. LSD-possessed Manson clan communists plot with Saracen terrorists to lead Christian youth away from Jesus and confiscate their money and guns, worry the former–with some justification as to the money. The Gaians’ nightmares are animated by Ku-klux mercantilist plutocrats advised by mad scientists and Hell-bent on turning the planet into a rotisserie,–with urine testing with licensing regulations so that only their toadies have jobs. Again, their fears as to urine-test blacklisting are not at all unfounded. This is the Cold War all over again, with different actors–but always and on both sides the same altruism and reliance on faith as opposed to reliable evidence. The one constant is the belief that altruism is a good enough reason to have someone else pick up deadly weapons and coerce some third party. But… by what standard is altruism or the initiation of force good? The Wikipedia has been a focus for infiltration by cranks with axes to grind, socialist orators, pseudoscientific panic-mongers, prohibitionists, looters, thieves and wannabee dictators. Donate money if you must, but please donate to a worthy cause. The Wikipedia is NOT that worthy cause. I personally consider the Libertarian Party a worthy cause. For similar reasons I have thought of giving to the NRA, LEAP (policemen against Prohibition), Naral (pro-choice) and other causes to which I am sympathetic. But I conclude that none of them can possibly succeed if LP.org fails. I do on occasion turn a tiny contribution over to Project Gutenberg the way I’d pay library dues, but this has a lot to do with a linguist’s profession and need for research material. Resumo: não dê dinheiro para a Wikipédia. Foram infiltrados por hostes contrárias à liberdade humana e à honestidade (que chegam a ser a mesma coisa).